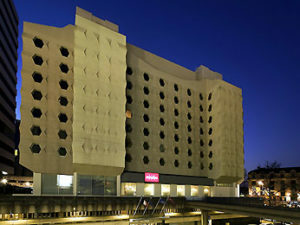 The Mercure Bordeaux Centre is a modern 4* Hotel in an ideal location for those looking to explore Bordeaux. The hotel also comes highly recommended for corporate clients, with its wide range of meeting rooms and a large restaurant. Mercure Bordeaux Centre is located close to the city centre, with numerous transport links, ideal for exploring the whole of Bordeaux just minutes away. Located close to everything you could need, with a shopping centre, bars and restaurants all within walking distance. 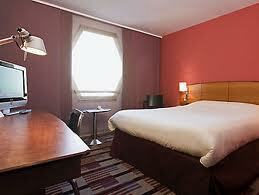 The guests within the 194 cinema-themed rooms of Mercure Bordeaux Centre are well served. There is a modern restaurant serving French cuisine, and a well stocked bar. For corporate clients the Meriadeck has 10 conference rooms suitable for anything between 10 and 300 people. Guests staying at the Mercure Bordeaux Centre can expect spacious rooms with modern decor and furnishings, all with en suite facilities. As would be expected from a 4* Hotel the rooms has A/C, satellite TV, a safe and a minibar. Each floor has a different theme, with the rooms corresponding to various cinematic genres, such as Western and Comedy. Smoking rooms are available upon request.